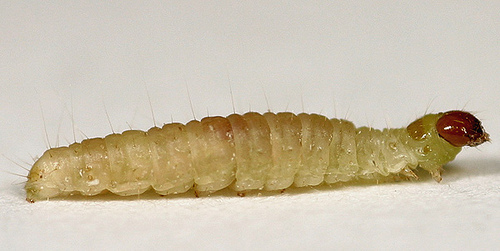 Pantry moths in Sydney are a real pest to homes, and it seems to be an increasing problem. All over the Sydney area every year we are helping people with these food pests, in particular during the warmer months. They are easily identified by their two tone colour wings and are small in size. As a general rule, the pantry moth is introduced into the via the food we buy from supermarkets etc... Mainly foods that have not gone through a heat process in their manufacture such as flour, rice, pasta, raw nuts and grains, cake mix and so on which have the moth larvae already inside. We bring the food home and with the right temperature their numbers increase rapidly. The larvae are often mistaken for fly maggots and will often be seen crawling vertically up the walls to make their cocoon on the ceiling. 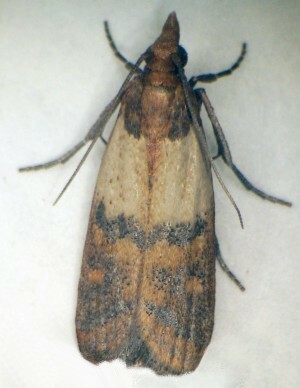 The pantry moth is near impossible to permanently eliminate and requires more of a pest management approach. The first thing to understand is that the factories and warehouses in which our food is made and stored have exactly the same problem, just on a bigger scale. In the industry there is an acceptable amount of pests that end up in any finished product. 1; When buying food products that are prone to infestation from the supermarket, look before you buy. Make sure there are no signs of webbing or larvae holes on the packaging, mainly in the folds. Also it helps to check the use by dates and get the product with the longest life. Theoretically it hasn't been packaged as long and may have a lower percentage chance of being exposed to the Indian meal moth. 2; At home store products that are high risk in the fridge or freezer. They are only active and breed in warmer conditions. 3; Empty the pantry and engage a qualified pest controller who can use a food and family safe product to spray the inside of the pantry and kitchen. The same product used in food manufacture sites and hospital kitchens. 4; Use a quality moth trap. We use and sell a professional pheromone lure made by Russell IPM. Please note that pheromone traps are not a total solution in themselves, they are a monitor to alert you if there is a problem when the caught numbers increase and require integration with regular checks on the food in your pantry. Rocket Pest and Termite Sydney is a family run business. We love what we do and it shows in our work. "Excellent service!! we are very happy with Rocket Pest and Termite and their high level of professionalism. They are the best pest control company we have ever had at our home since we bought it about 15 years ago. We get pest control done every year and no other company has ever done as much and been so thorough. Paul also did the most comprehensive termite inspection i have ever seen. We certainly recommend Rocket to anyone."